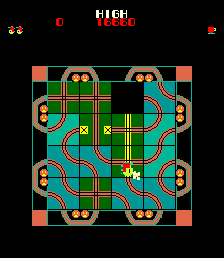 Locomotion is basically an updated version of the sliding block puzzle game, where you can move pieces horizontally or vertically within a frame to complete a picture. In this game however, everything's moving! You control the playfield and your aim is to guide your train around the tracks collecting the passengers waiting at the stations located around the edges of the screen. Your controls are simple: up, down, left and right to slide a piece of the track into the vacant square, and the fire button to speed up your train. The train is always moving, but you have the option of making it move faster to get to the passengers more quickly. You must avoid crashing your train into the dead end pieces of track (marked with a yellow 'X'), and also ensure the train does not run off the edge of the screen, either of which instance costs you a life. There is also an enemy Crazy Train located on the track which can also move around as your train does. You must avoid crashing into this as well. Sometimes the passengers waiting at one of the stations will be replaced by a countdown timer: this is a bonus station. If the timer reaches zero then another Crazy Train is added to the track. If you collect the passengers before the timer counts down, you are awarded the points on the counter. When there is more than one Crazy Train on screen, you can make them crash into each other, and you score a bonus, and both are removed from the screen. As you move the pieces of track around, the route your train will take is highlighted in yellow up to any dead end. On some screens there are special four-way segments of track with a small circle of track in the centre: these have one entrance and 3 different exits. You cannot choose which exit your train takes from these, as it is picked randomly for you. You score bonus points each time you cross one of these pieces of track, but they do make it tricky for you to plan your route to a station. 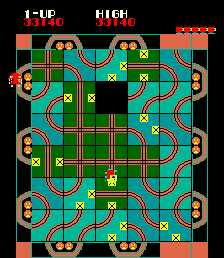 The level is cleared when all passengers are collected, and you then move onto the next level which is a different layout, bigger or smaller with more dead ends. 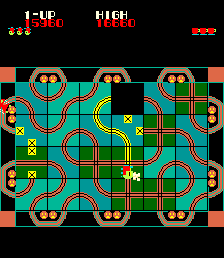 Also the bonus stations appear more frequently and on later levels more than one Crazy Train is on screen at the start of the level. If you should create a closed loop of track and move round it too many times, a loop sweeper appears which moves around the loop behind you. If you do not exit the loop quickly enough, the sweeper catches up with you and you lose a life. You start with three lives and extras are awarded at 30,000 and every 70,000 points. Scoring Countdown bonus: time remaining on counter. Clearing a station: 100 points. Random Exit Track: 150 points per crossing. Clearing a level: 1,000 points. Clearing a level by getting all passengers: 5,000 points. On early stages aways go for the bonus stations, as they yield the biggest points score during normal gameplay. If a bonus station timer is getting low, don't go for it unless you are 100% sure you will make it. It's not worth risking a life for a 20 point bonus! Learn to move the track quickly, as this is the key to getting your train to its desired target. You should be able to move a piece of track 3 or 4 times while your train is still on it, moving at normal speed. If you have a long route opened up in front of you, run it at full speed, but remember it takes a couple of seconds at the end for your train to slow to its normal speed. When your train is moving along a long route try to plan where it will go next by moving pieces your train has already passed over and maybe even swapping some of those around ahead of you to change your route.